Bidvest Events specialises in supplying first-class temporary or contracted staff to the Hospitality, Corporate, Entertainment, and Events and Meetings Industries. Trustworthy personnel are carefully selected and given ongoing training to ensure service excellence. With over fifteen years’ experience, Bidvest Events will save you management time and increase productivity while offering optimal cost efficiency through flexible solutions tailored to meet the fluctuating demands of your business. We ensure our staff arrive on-site at the right time, in the right attire, ready to help make your event a success. As part of the holistic Bidvest Events offering, our event cleaning staff are expertly trained to ensure the smooth running and clean-up of any event. We boast a broad complement of cleaning specialists who are able to work in kitchens, public areas and bathrooms. All cleaning staff are skilled and trained in different cleaning methods, have good communication skills and work well under the expert guidance of our management team. Bidvest Events food staff are all skilled through work experience or qualifications and are recruited from hotel schools or other established sites. Our offering includes the services of cooks, food service assistants (FSAs) and chefs. Our FSAs can perform basic functions in kitchens and work well under supervision, while cooks are able to perform more complex functions including preparing dishes. We also offer the more advanced services of Chef de Partie. These individuals can prepare menus and buffets, work with little supervision, and deliver high-calibre service. At Bidvest Events, we understand the important role front-of-house staff play in the overall event experience. Our team pride themselves on delivering only the best service, in the most professional way. For events, we are able to provide staff for both à la carte and banqueting requirements. Our waitrons are highly skilled and completely comfortable interacting with guests. They work under supervision and can take food and beverage orders. We also offer the services of Elite Waitrons who are experts in managing guest experiences and are able to work completely independently. We provide bar staff solutions including barmen and cocktail bar staff who can work off an existing menu or design their own as required. Our Bar Captains manage a pool of bar staff and manage all bar processes and stock. Our staff are always highly energetic and excellent with customers. Bidvest Events offers the services of managers and supervisors from an operations level to back-of-house, based on your specific event requirements. All of our senior staff are extensively trained and groomed for three- to five-star establishments. 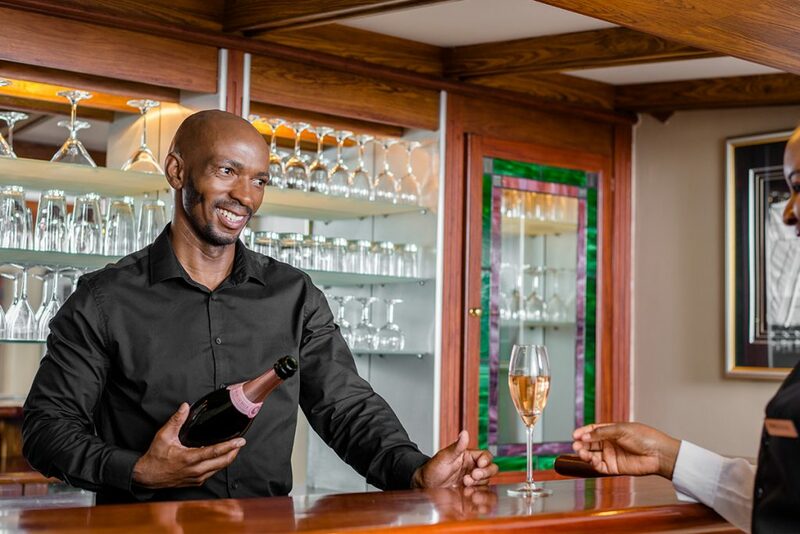 With excellent communication skills, they can work independently and expertly manage teams of staff – while also managing guest relations with the utmost finesse.